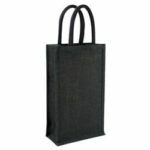 The A4 Jute Shopper Bag is manufactured with 100% natural jute that has a nice, good-looking texture. Its inner lining is laminated in plastic to keep your belongings safe from outer weather. The bag has a size of 380 mm × 225mm and a shape of an A4 size sheet. Two webbing handles come attached to the bag, making it easier and more comfortable to carry it. The natural finish is attractive and plays great canvas to ensure that your business logo stands out. The 200 mm × 180 mm size of its printable decoration panel provides ample space to customise the bag with easily visible logo. 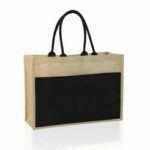 The A4 Jute Shopper Bag is a great alternative to ordinary plastic bag promotional products. This bag is not only more attractive but of better quality that will speak your business attitude. It will improve your business reputation and keep its presence felt by the customers. Every time the customers use this multipurpose bag, it will remind them of your company. Basic print cost includes a single colour print on one side. You can print both the sides in multiple colours by paying extra.